The National Low Income Housing Coalition’s annual housing report has been released and it once again shows the dramatic divide between average housing prices and income in the United States. In order to afford a modest, two-bedroom apartment in the U.S., renters need to earn a wage of $19.35 per hour. 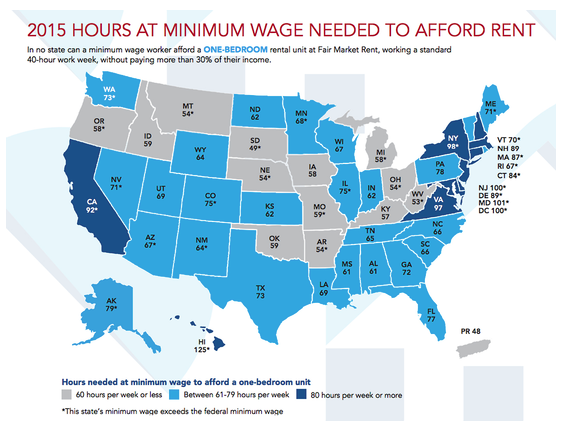 In 13 states and the District of Columbia they need to earn more than $20 per hour. 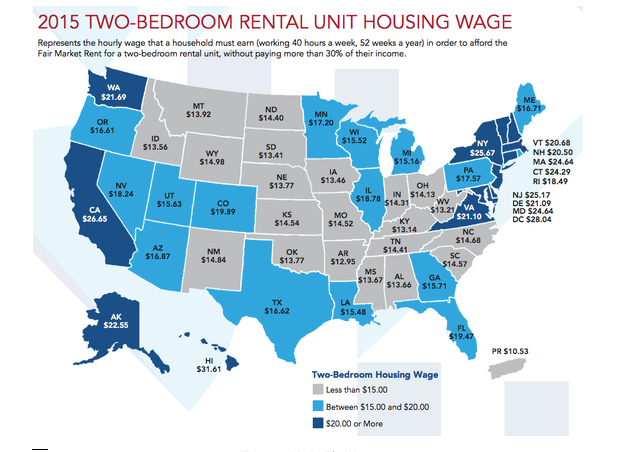 The Housing Wage for a two-bedroom unit is more than two and a half times the federal minimum wage of $7.25, and $4 more than the estimated average wage of $15.16 earned by renters nationwide. Living in New York City, therefore, puts me in the third highest rental bracket in the country (after D.C. and Hawai’i). No wonder I’m struggling! If you study these maps carefully, it’s truly mindblowing (as we used to say)! My rent is almost 100% of my income! It gives one pause . . . This entry was posted in Earth and tagged federal minimum wage, housing prices. Bookmark the permalink.